Looking for a porch addition in Central Kentucky? Look no further than Thomas Quality Construction. Our porches and sunrooms are always built to blend with the design of the home, rather than look like a poorly-planned afterthought. From a simple screened porch to an energy-efficient sunroom, Thomas Quality Construction will build the perfect outdoor space for you. Homeowners throughout Central Kentucky turn to the building experts at Thomas Quality Construction when they want stunning outdoor living spaces created at their homes. Locally owned and operated, Thomas Quality Construction has years of building and custom home improvement experience. We can provide you with custom construction of a porch, sunroom, screen room or other structural additions that will blend perfectly with your unique tastes and the existing style of your home. When you choose Thomas Quality Construction to do the job for you, you’ll be working with a team that has an unparalleled commitment to building high-quality projects that will guarantee your best value. We are recognized for our great building services and our personalized customer service. In everything we do, no matter how large or small the job, we complete the work with superior quality and great craftsmanship. Additionally, we use only the finest materials. Attention to detail. We build your porch or screen porch knowing this is a special place for your home. Quality construction. Your porch will be built with quality materials by our team of home specialists. Affordable porch options priced to meet your budget. We offer many options and styles for porches and screen porches. Experience. We know that a porch or screen porch is a great place to relax and enjoy quality time. We have years of experience building porches. Enjoying a summer breeze on a beautiful custom porch is part of our way of life in Central Kentucky. Thomas Quality Construction has been designing and building new porches in Lexington, Richmond and surrounding counties for years. Homeowners throughout Central Kentucky have made Thomas Quality Construction their trusted choice to build high-quality, long-lasting custom screen porches, wraparound porches, front porches and other porch additions for their homes. Our commitment to deliver the highest standards of workmanship on every porch addition is one we do not take lightly. We don’t subcontract your porch addition project. Your porch project will be completed by our professional porch construction team. Our high standard of quality will be consistent throughout the construction of your new porch. 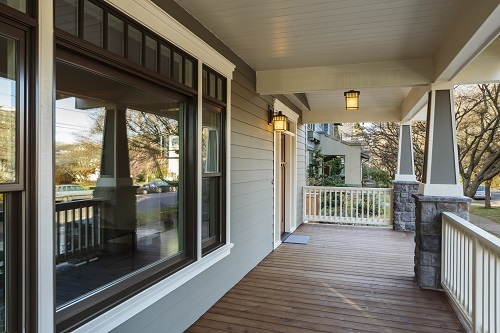 Some people choose glassed-in porch construction for a wide variety of reasons. Sometimes, the existing porch gets too much direct sunlight, breeze or rain. We can make it comfortable. Enclosing the area completely in glass can create a sunny sitting room or a play room for the kids. Glassed-in areas can be heated and air conditioned. Ceiling fans are very popular, too. Thomas Quality Construction can do much more than building porch additions. We have deep roots in home construction and can perform virtually any home improvement service or repair. We have years of experience installing new roofing, energy-efficient windows and doors, siding and many other products in addition to performing interior renovations. If you would like to enhance an outdoor or indoor area of your home, contact Thomas Quality Construction, a premier home improvement company.